MISSISSAUGA, ON--(Marketwired - Oct 6, 2015) - The American Academy of Cosmetic Dentistry (AACD) is the world's largest organization of cosmetic dentists. Over 6000 dental professionals, educators, laboratory technicians, and researchers are currently members, including Dr. Arun Narang. A cosmetic dentist in Toronto, Dr. Narang was recently appointed to the AACD Board of Directors. He explains that this new role offers an abundance of opportunity and expanded responsibilities. Essential aspects of his position, he states, will be helping patients achieve the highest quality of care and encouraging dental professionals to apply for accreditation. Dr. Narang has been a member of the AACD for almost 20 years. As a sustaining member, he often takes advantage of the training and educational opportunities the AACD presents. The institution, founded in 1984, is dedicated to preserving the highest level of patient care and maintaining a high standard of ethics. The AACD says that it accomplishes this, in part, by providing access to the most advanced dental technology available. Dr. Narang believes this is one of the many reasons membership in the AACD can benefit dentists and their patients. "This organization is about always learning; one of our catch phrases is 'great dentists are always learning.' I believe this wholeheartedly, and it is why I became a member." Now, as an appointee on the Board of Directors, Dr. Narang has the ability to attract a new generation of dentists to the AACD, which has the potential to enhance the quality of dental treatment around the world. Ultimately, Dr. Narang hopes to continue providing the best patient experience possible at his practices while contributing to the global advancement of cosmetic dentistry. "I feel my experience can help the AACD become a stronger organization; one that is committed to complete, responsible cosmetic dentistry." Dr. Arun Narang is a general, cosmetic, and restorative dentist practicing in the Mississauga, Oakville, and Toronto area. In addition to sitting on the Board of the Professional Education Committee for the American Academy of Cosmetic Dentistry (AACD), he is also the Past President and Executive Member of the Toronto Academy of Cosmetic Dentistry (TACD). With over 31 years of experience, Dr. Narang has received numerous awards and honours, including acting as host for the "Smile File" on Rogers TV and being published in the Mississauga News & Oakville Beaver. A dedicated philanthropist, he supports Operation Eyesight Universal, Children's Wish Foundation International, and several other charities. Dr. Narang is available for interview upon request. 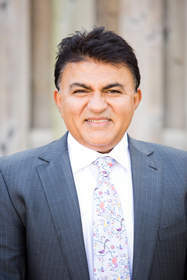 For more information about Dr. Narang and his practice, please visit smilebydesign.com and facebook.com/DrArunNarang.